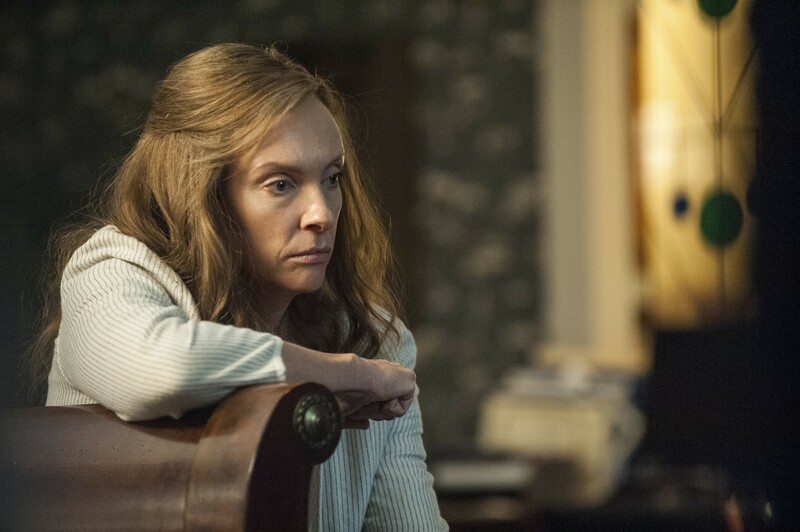 The new horror flick Hereditary has quite a few things going for it: crisp and elegant production values, a fine sense of place, and, most importantly, a take-no-prisoners performance by veteran character actor Toni Collette. Nevertheless, it ultimately leaves us thinking about what might have been rather than what actually happens onscreen. The household of Annie Graham (Collette) is in full disarray from the very start. Her mother, whom we never meet except in hallucinatory flashbacks, has just died and Annie is completely devastated. The woman obviously meant a lot to her. Annie's milquetoast husband Steve (Gabriel Byrne), their alienated teenage son Peter (Alex Wolff), and their preteen daughter Charlie (Milly Shapiro) are not nearly so broken up about it. The relationships in this family are strained to the breaking point, and probably always have been. Annie channels her grief into her art, a highly detailed set of doll houses plus a mysterious tree house. A local gallery is interested, but that doesn't prevent her from being a bundle of nerves, guilt, and anger. Meanwhile Steve dithers timidly, uncommunicative Charlie obsessively sketches people's faces, and Peter, the object of much of his mother's scorn, withdraws from the family with his bong and his partying friends. Pretty much a standard American family. But strange things begin to happen.